The Council on American-Islamic Relations has, since its founding in 1994, served as the Islamist movement in North America's most high-profile, belligerent, manipulative, and aggressive agency. From its headquarters in Washington, D.C., CAIR also sets the agenda and tone for the entire Wahhabi lobby. A substantial body of criticism about CAIR exists, some of by me, but until now, the group's smash-mouths and extremists have managed to survive all revelations about its record. 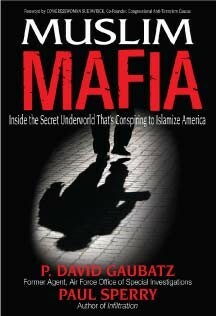 The publication today of Muslim Mafia: Inside the Secret Underworld That's Conspiring to Islamize America (WND Books) may, however, change the equation. Written by P. David Gaubatz and Paul Sperry, the investigation is based largely on the undercover work of Gaubatz's son Chris who spent six months as an intern at CAIR's D.C. headquarters in 2008. In that capacity, he acquired 12,000 pages of documentation and took 300 hours of video. Chris Gaubatz's information reveals much that the secretive CAIR wants hidden, including its strategy, finances, membership, and internal disputes, thereby exposing its shady and possibly illegal methods. As the book contains too much new information to summarize in small compass, I shall focus here on one dimension – the organization's inner workings, where the data shows that CAIR's claims amount to crude deceptions. 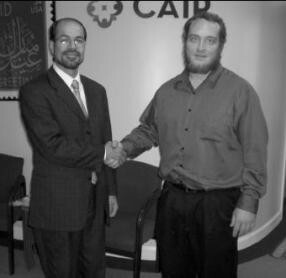 CAIR Executive Director Nihad Awad and undercover intern Chris Gaubatz at CAIR's national headquarters in 2008. Claim 1: According to Ibrahim Hooper, the organization's communications director, "CAIR has some 50,000 members." Fact: An internal memo prepared in June 2007 for a staff meeting reports that the organization had precisely 5,133 members, about one-tenth Hooper's exaggerated number. Claim 2: CAIR is a "grass-roots organization" that depends financially on its members. Fact: According to an internal 2002 board meeting report, the organization received $33,000 in dues and $1,071,000 in donations. In other words, under 3 percent of its income derives from membership dues. Claim 3: CAIR receives "no support from any overseas group or government." Fact: Gaubatz and Sperry report that 60 percent of CAIR's income derives from two dozen donors, most of whom live outside the United States. Specifically: $978,000 from the ruler of Dubai in 2002 in exchange for controlling interest in its headquarters property on New Jersey Avenue, a $500,000 gift from Saudi prince al-Waleed bin Talal and $112,000 in 2007 from Saudi prince Abdullah bin Mosa'ad, at least $300,000 from the Saudi-based Organization of the Islamic Conference, $250,000 from the Islamic Development Bank, and at least $17,000 from the American office of the Saudi-based International Islamic Relief Organization. Claim 4: CAIR is an independent, domestic human rights group "similar to a Muslim NAACP." Fact: In a desperate search for funding, CAIR has offered its services to forward the commercial interests of foreign firms. This came to light in the aftermath of Dubai Ports World's failed effort to purchase six U.S. harbors in 2006 due to security fears. In response, CAIR's chairman traveled to Dubai and suggested to businessmen there: "Do not think about your contributions [to CAIR] as donations. Think about it from the perspective of rate of return. The investment of $50 million will give you billions of dollars in return for fifty years." 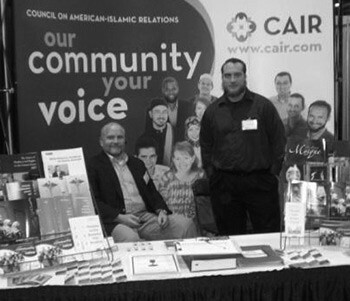 CAIR Communications Director Ibrahim Hooper and Chris Gaubatz work CAIR's booth at the Islamic Society of North America meeting in Columbus, Ohio, in 2008. Combining these four facts reveals a CAIR quite unlike its public image. Almost bereft of members and dues, it sustains itself by selling its services to the Saudi and U.A.E. governments by doing their ideological and financial bidding. This in turn raises the obvious question: should CAIR not be required to register as a foreign agent, with the regulations, scrutiny, and lack of tax-deductible status that the designation implies? Data in Muslim Mafia certainly suggests so. Looking further ahead, I expect CAIR's days are numbered. It's a dirty institution, founded by Islamic terrorists and with many subsequent ties to terrorists. Over the years, it has established a long record of untrustworthiness that includes doctoring a photograph, fabricating anti-Muslim hate crimes, and promoting suspect polling. It has also intimidated critics via libel suits, boasted of ties to a neo-Nazi, and allegedly paid hush money. Eventually, close scrutiny of this outfit will likely lead to its demise. That's the good news. Less happy is my expectation that CAIR's successor will be a more savvy, honest, respectable institution that continues its work of bringing Islamic law to the United States and Canada while avoiding the mistakes and apparent illegalities that render CAIR vulnerable. In that sense, the fight to preserve the Constitution has just begun. Related Topics: Council on American-Islamic Relations | Daniel Pipes receive the latest by email: subscribe to the free mef mailing list This text may be reposted or forwarded so long as it is presented as an integral whole with complete and accurate information provided about its author, date, place of publication, and original URL.